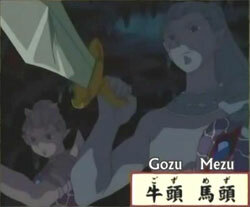 A different version of Gozu and Mezu also make their appearance in episode 17 (Cursed Ink of Hell-Painter). 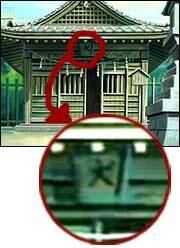 …the Dry Well hut in the Higurashi Shrine has the word 'Inu' or '犬' on the signboard on top? I wonder if Inuyasha ever noticed? KAG: A fragment lies at the boundary between this world and the next. The only path is the gate at the Fire Country, but it is guarded. Naraku has set a trap for us!